This is our collection of strange places where people still live. It’s more than a collection of strange houses of which there are millions, it’s a demonstration of the relationship that humans have with their environment and the way in which they have used and shaped it to their own needs. After reading this section you too will believe that humans probably have the ability to live anywhere. 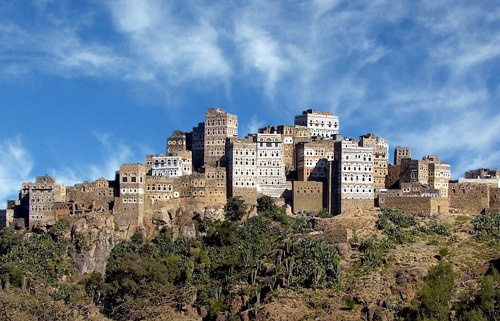 This incredible walled town has been built on the top a massive rocky outcrop within the Haraz Mountains of western central Yemen in a region known as the San‘a’ Governorate. Its history is so ancient that not even the inhabitants can be sure when the first settlers arrived but it is officially said to date back to at least the 12th century. The houses themselves are fortified and feature substantial storage facilities such as granaries and cisterns in case of siege. Secluded and remote, its culture and traditions have survived into the 21st century. Al Hajarah literally means “Of (the) Rock”. The lands surrounding the town are relatively fertile and the area receives sufficient rain to grow wheat, barley and grasses which support typical Arabian livestock such as goats, camels and horses. Its inhabitants are said to be friendly with a passion for dancing and traditional music. The multistory houses of Al Hajarah have evolved and been rebuilt over the centuries slowly and completely covering the upper section of the outcrop. This has meant that by necessity the streets are narrow and some buildings seem to balance precariously on the edge of precipitous cliffs. 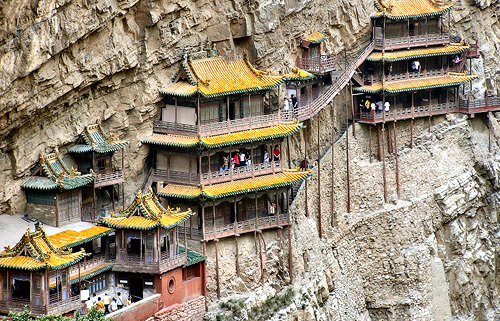 There are five Most-Sacred mountains in China and Mt. Heng (Heng shan) located in Shanxi province is one of them. Close to its base and overlooking the wooded Golden Dragon River (Jinlong he), is Xuankong Si, sometimes written as Xuan Kong Si, which literally translates as the Monastery in Mid Air. It is more often called the Hanging Monastery. Built in 491AD it still clings to the side of the cliff using engineering techniques that are still of significant interest to modern architects. Horizontal shafts were first cut into the side of the mountain to serve as the anchor points. Strong lengths of hard wood cut from single trees were then driven into the holes. The depth of the holes and the hardness of the rock provided a strong base. There are sufficient supports to ensure that if the crossbeams ever need to be replaced then one can be removed at a time without impacting on the structural integrity of the monastery. It may be the first recorded instance of deliberate over engineering. The reason Xuankong Si was built so high above the ground may be one of practicality – defense against marauders or protection from floods. The more romantic version is that the Monks were dedicated to silence and so high above the ground they might achieve this ideal. It is said that they were forbidden to hear the barking of dog, the wailing of a child or even the sound of a rooster crowing as it welcomed the dawn. It is now largely a tourist attraction but caretakers are said to still live in its caves and halls. This bizarre but beautiful place located in the ancient region of Anatolia in modern day Turkey may be one of the oldest examples of continuous human habitation in the world. It is an incredible example of how people have shaped and modified the already unusual geology and yet retained the natural mystery of its rocky spires and eye-twisting landscapes. It is a UNESCO World Heritage Site and there are records from the 6th century BC that describe it, even then, as one of the oldest regions of the Persian Empire. 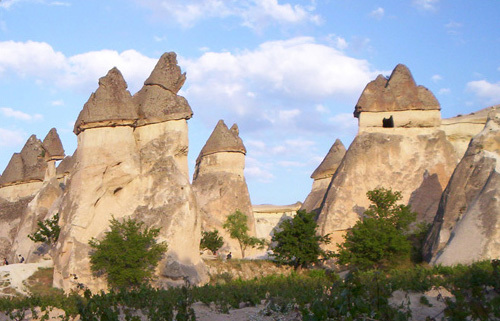 The best examples of this form of human habitation can be found in the town of Göreme where sandstone deposits have been eroded into hundreds of spectacular toadstool shapes. In turn, these have been carved into by the inhabitants and turned into homes, monasteries, churches and even a police station. It currently has a population of 2,500 people and is one of the most famous historic tourist destinations in Turkey. While it is believed that the area of Cappadocia and Göreme has been inhabited by people for many millennia it was during the Roman period that it was significantly expanded by new settlers and Christianity became the dominant religion of the region for the next several hundred years. An interesting side note is that in German it is known as Love Valley – Tal der Liebe. the Romans are said have named it Ager (Agri) Phallus. Have a look at some of the other pictures of Göreme on Wiki Media Commons and you will understand why. Nature’s Humour! In the heart of central Greece and on the edge of the Plain of Thessaly are the Metéora, which literally means the rocks suspended in air. It’s from this word that we get the modern word meteors – rocks from outer space. In reality they are pillars of harder than average sandstone that have survived the erosion of the softer material that once surrounded them. 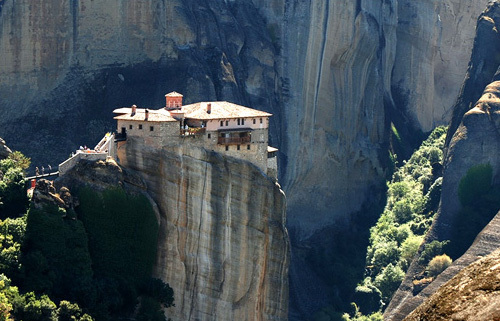 Six religious retreats have been built on top of these pillars and one of the most famous is the Roussanou Monastery. It was rebuilt by two brothers, Maximos and Ioasaph (Joseph)*, in 1545 and dedicated to St. Barbara whose sacred day is the 4th of December. Over the centuries its fortunes grew and faded. From 1730 to 1937 it was largely uninhabited although many of its relics remained within its walls. Shortly after the Nazi occupation of Greece in 1941 it was stripped of its treasures by the occupying soldiers. Most of these have never been recovered. The monastery consists of three levels which include the church, cells, guest quarters, reception halls and a display hall. It is truly a remarkable place that has to be seen to be appreciated. Sadly, the new road at the base does detract from the mystery. Since 1988 Roussanou Monasteryhas been the home of a small group of nuns. Since the construction of a wooden bridge in 1800’s it has been relatively easy to visit the location and the nuns are said to be quite welcoming. As with Rosslyn Chapel in Scotland there are rumored to be sealed caves carved into the stone under the building but, as yet, no excavations have been permitted. *The original brothers that founded the monastery are occasionally referred to as Nikodemus and Benedict. It’s amazing how people have the ability to take even the most unusual of environments and still find a way to build their homes. Setenil De Las Bodegas is one such place. Located in the Andalucía province of Spain it has a history that may date back many thousands of years. What makes it special is the way that its inhabitants have carved away the walls of the gorge and then built their houses into the recesses. These are not the ruins of Mesoamerican Native Indians or the abandoned caves of lost biblical civilizations. These are homes that have been built and rebuilt over the centuries and are still occupied to this day. Outcrops of ancient rock loom over the main street that has been built beneath. In one place there are houses that have a million tons of rock above them and on top of that rock there are even more houses. 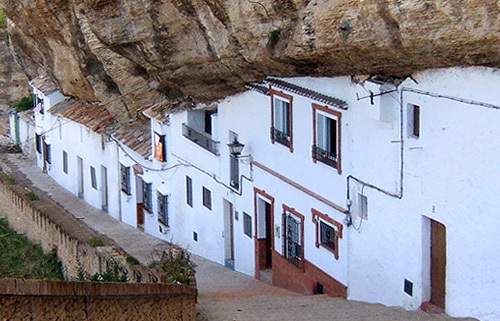 In Setenil De Las Bodegas one persons’ basement – dug deep enough – is another persons’ roof. The village is a settlement that has slowly extended along the route of the Trejo River and may well still be occupied long after the newer cities full of brash lights have vanished. Literally translated the name means House of Stone and it is located in the Fafe mountains of Northern Portugal. It is ten kilometres north-east of Fafe and can be found on Google earth at these co-ordinates: 41° 29′ 17.52″ N 8° 4′ 4.84″ W. It was originally built as a mountain retreat around 1974 by an engineer from nearby Guimarães who was inspired by the natural space provided by four large boulders. Due to its isolation it has on occasions been the target of vandalism and robbery. Its unusual design has also stimulated a steady traffic of tourists who are not beyond peering through the windows or even trying to enter uninvited. At the time of writing this article (2010) it is owned by Vitor Rodrigues who has had to have heavy security doors and barred windows fitted to protect the house. The interior is larger than might be expected and is beautifully rustic with a large wooden bench-style table and balconies. It is not a fake. 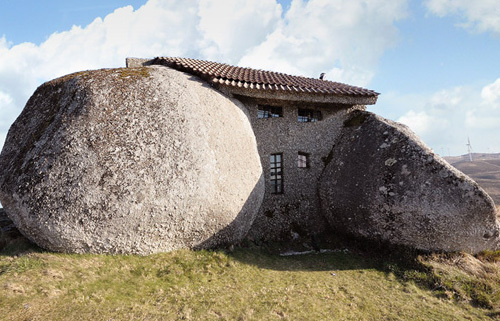 There have been several claims that Casa Do Penedo is a hoax created by a Photoshop artist but it is definitely real. It has been featured on Portuguese television, in the British Daily Mail Newspaper and on countless architecture websites. The closest village is Pereira which is 1.3 kilometres to the south. In the city of Firenze (Florence) Italy is a remarkable bridge. 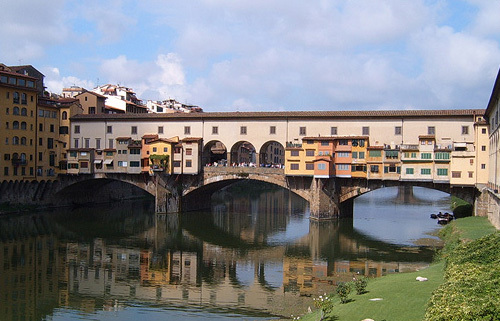 Known as the Ponte Vecchio, or the “old Bridge” in English, it spans the river Arno. The bridge seen in the photograph was originally constructed in 1345AD after two of its predecessors had been destroyed by flood waters. What makes it unusual is that it is one of the few surviving bridges to have tenanted shops built along its span. Originally these were almost exclusively butchers, perhaps because of the direct access to the waters of the river and the ease of disposing offal and the like. Over the centuries the shops and houses along the bridge were increased and so was its prestige. In 1593 butchers were forbidden to sell on the bridge and the shops and houses were quickly taken over by gold and jewel merchants – a tradition that persists to this day. Although it was once the practice for people to live above their shops this has largely ceased although it is rumoured that some of the Ponte Vecchio shops still have small apartments hidden out of site of the many tourists and inhabitants of Firenze, Italy. The waters are calm but could you sleep if they weren’t? Located 355 kilometres to the south of Tunis (the capital of Tunisia) is the remarkable settlement of Matmâta. Here the inhabitants have dug deep pits into the ground and then tunneled into the side walls to create their homes. Not only is this site ancient and probably dates back to the Roman period and Punic Wars, its existence remained largely unknown until the mid 1960’s. 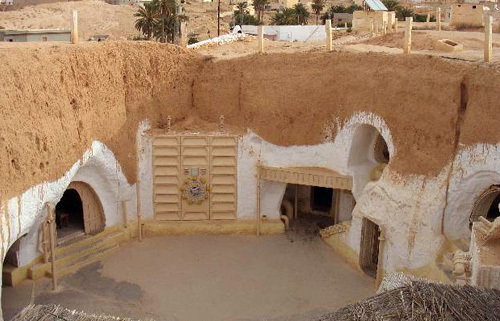 It truly came to the attention of the world when it was selected as the location for Luke Sky Walker’s home on the planet Tatooine in the Star Wars film – A New Hope (1977). There are various legends to explain why the Berbers of this region started to build their homes in this fashion. One is that it was to hide from the invading Egyptians and another is that they already existed to some extent and were the original caves of desert monsters that had long since departed. This very strange place to live and is often described as a micro-nation due to that fact that it is (was) outside of the territorial waters of any country. Some reviewers have even awarded it the status of the World’s smallest sovereign state. 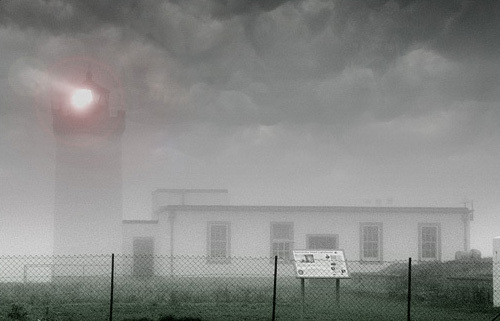 In fact, it is an old world War II Maunsell Sea Fort and is about 13 kilometres off the island of Great Britain. The nearest coastal town of significance is Harwich located in Suffolk. Major Paddy Roy Bates, an already famous figure in British pirate radio, occupied the platform during September 1967 with the intention of broadcasting Radio Essex from the site. Since this date the micro-nation of Sealand has had an interesting history including an invasion, a hostage crisis, hashish smugglers, several leadership battles, the assassination of Gianni Versace, a passport scandal and a minor diplomatic crisis involving Germany. 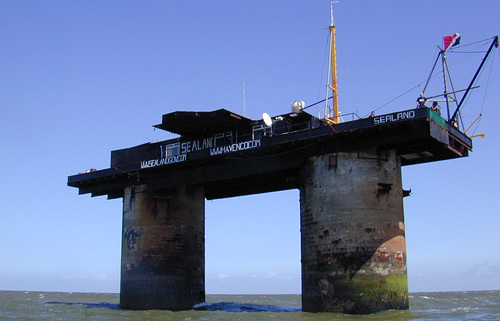 The Principality of Sealand is currently the home of several caretakers while its de facto ruler, His Highness, Prince Michael (Bates) Regent of Sealand, currently resides in Essex. (2010) Sealand has, in the past, produced its own passports and currency. 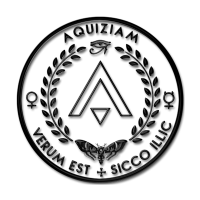 It has even been represented in various international sporting events. You don’t get much stranger than this. Duncansby Head lighthouse is almost the most northern point of the Island of Great Britain and is located 2.5 kilometres from the tiny town of John o’ Groats. The town itself is famous for the same reason and is considered to be the furthest point from land’s End in Cornwall. These two towns, if joined by a straight line represent the furthest linear distance on the British Isles and it is not uncommon for people to drive, cycle and even hike from one to the other – a distance of approximately 1,350km if you take the most direct roads. During the summer months John o’ Groats and its striking cliffs is a beautiful destination, if slightly run-down. However, during the winter months it is harsh and unforgiving place to live. Snow and thick fogs are common and the town becomes becomes deserted except for its 300 or so residents. It is believed that the town’s strange name, John o’ Groats, came from Jan de Groot (John the Big) in or around 1486 after he was awarded the right to operate the ferry to the nearby Orkney Islands.